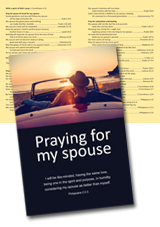 Dozens of scriptures to help you pray for your wife or husband. Pray them daily and see God work in his or her life! This handy tool tucks right in a Bible for repeated reference.